Triple sevens have always brought good luck to Canadian gamblers. 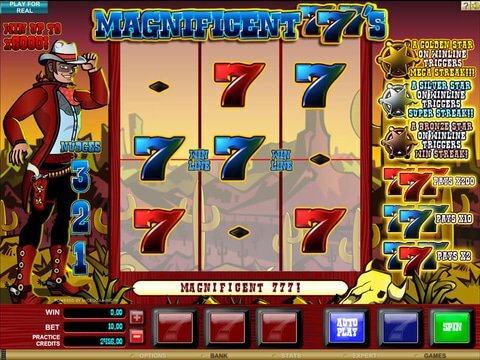 This review of the Magnificent 777s slot machine from Microgaming is based on one of their most popular classic options and boasts a western theme. There are three reels and a single payline here, but unlike many of its traditional counterparts, this one has a bonus feature that is quite exciting. You can try a Magnificent 777s free play slot demo right here on this page that always offers no download, no registration fun, or you can head over to Gaming Club Casino where you'll get not only a 100% match of your first deposit worth up to $350, but you'll also get 30 free spins on the Mad Hatters game! Choosing your bets for this particular title is simple. Whereas most of the time there is only one denomination from which to choose and the ability to spend from one to five of these coins on the payline, this title is the opposite. You only get to spend one coin per spin, but you can choose denominations, and therefore minimum and maximum wagers, of $0.10 to $10. The maximum jackpot is 200 coins, so depending on the coin chosen, it is worth anywhere from $20 to $2000. There is no progressive jackpot to note, and at the time of writing, this title was not available on any mobile platform. While the Magnificent 777s slot machine does not provide any of the more traditional features like wilds, scatters, free spins or second-screen bonus rounds, there is a multiplier that goes into place whenever a Sheriff's Badge appears on the screen. There are bronze, silver and gold options that can award you with multipliers up to 550x, and this can seriously boost the amount that you can win instantly. If you are a fan of the triple sevens but you want something a bit different with more bells and whistles, then the Triple Profits machine from Playtech might be more your style. It offers up nine reels and three paylines with a money theme, a wild symbol, the ability to hold reels in place, and even a second screen bonus game in which you choose bags of cash for instant wins. The best part is that the jackpot is worth a handsome $25,000.